We are excited to announce that registration is now open for our 17th Annual National Teacher Institute. This year’s event will be held in historic Memphis, Tennessee, and we are proud to partner with the National Park Service, the History Channel, and Graceland to bring you this event. Our National Teacher Institute is FREE to K-12 educators, and a limited number of travel scholarships are available. This unique professional development opportunity allows educators to engage with, and learn from, Civil War experts, museum professionals, and other like-minded educators. The docket of events is chock full of exceptional workshops, behind the scenes access to rarely seen artifacts, and one of a kind tours. Attendees will have the opportunity to walk in the footsteps of Confederate General Albert Sidney Johnston as they retrace his final hours with Shiloh battlefield expert Timothy Smith; see history brought to life by NPS historians through live-fire artillery demonstrations; and listen to the engaging, best selling author Robert Hicks as he regales us with one of his legendary stories. Also back by popular demand is Garry Adelman’s Civil War Photo Extravaganza for Teachers! Workshops, vendors, and a panel discussion led by our own teacher-in-residence Jim Percoco are just some of the other items we have in store. There will also be a trip to Graceland! Don’t be left out of this top-notch event for educators, July 13-16, 2017, in Memphis, Tennessee. Join our Teacher Regiment Facebook page to keep up-to-date with all our announcements. And check out all of our great online videos, which are great assets for educators. If you have any questions, email . If you are not a k-12 educator yourself but know someone who is, please forward this email to them! 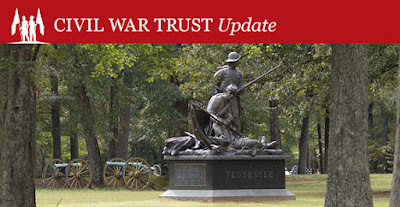 At a recent news conference in Nashville, the Civil War Trust thanked Tennessee officials for their unprecedented commitment to the protection of their state’s battlefields. Tennessee is the first state to guarantee money for Civil War site preservation each year, and the Trust has already used the fund to preserve 100 acres at Chattanooga and Shiloh. We remain committed to saving Civil War land in Tennessee by multiplying your donations with outside matching fund sources. We are currently trying to save 63 acres in the Volunteer State at Fort Donelson and Parker's Cross Roads battlefields. Learn more about this historic land and make a gift today.